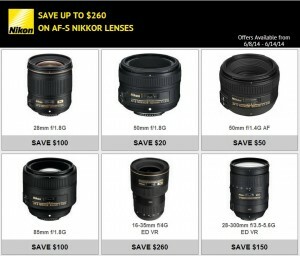 Nikon Instant Rebates on 6 Lenses — One Week Only! Posted June 8, 2014 at 4:00 pm . 0 comments. Nikon has started a Father’s Day Instant rebate on 6 popular lenses. You do not need to purchase a body to take advantage of the rebate. This instant is only available until June 14th!